Yes, we certainly are. In fact 9 new kids arrived in the past couple of days! 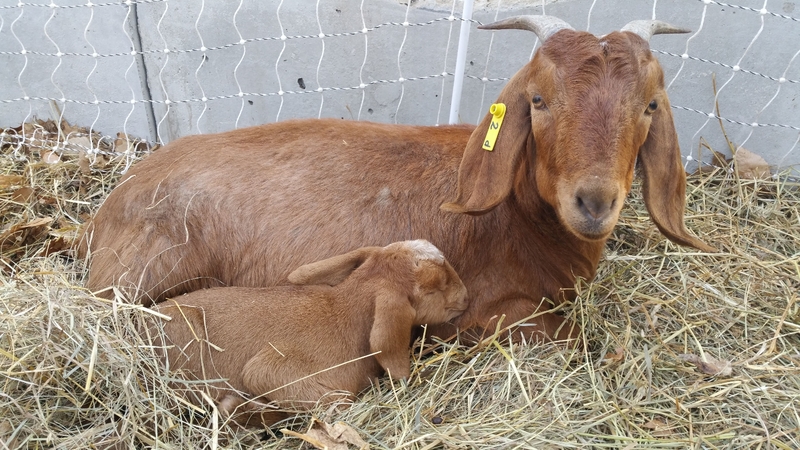 On Wednesday, within a relatively few hours, four of our expectant does gave birth to 7 kids. Hardly had we finished “superintending” one of them when another went into labour. 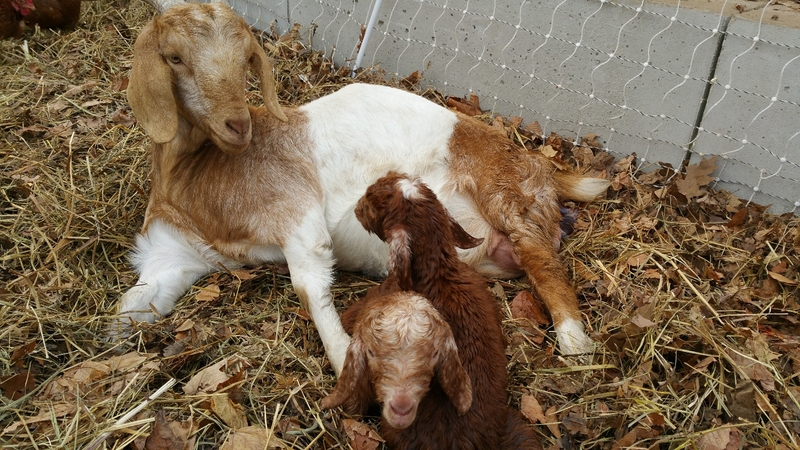 One of the young does gave birth to her first twin outside on a pile of leaves. We were helping clean up two kids inside the hoop house when we heard some groaning outside. By the time I had ran around to her, one kid had already been born. I wrapped it in a towel and took it inside, leading the mother. Her labour started again as we entered the hoop house and I had to help her in. Another young one started to go into labour outside while standing on the goats’ rock pile. I helped her in and she gave birth within minutes. 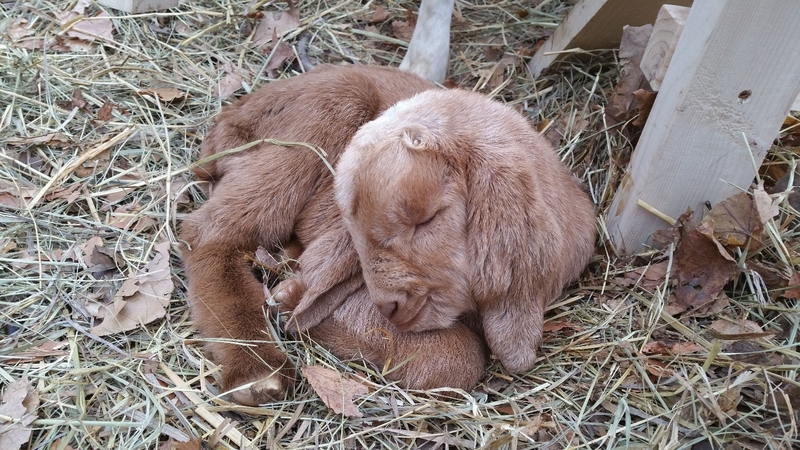 Another two kids were born last evening. We think that they are now finished but there is a slight possibility that one more doe might be pregnant. 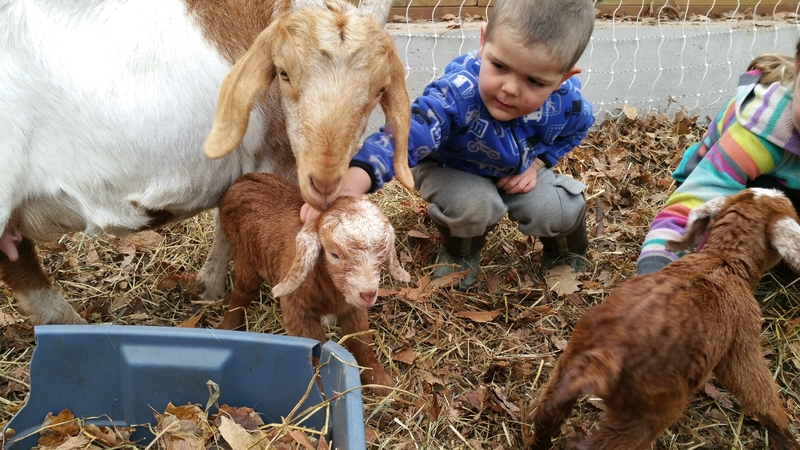 Six of the kids are bucklings and three are doelings. A young, first time mother with her two little kids, still wet. One was delivered outside, the second inside immediately after I brought her in. Within hours of birth, after having been cleaned and dried by his mother’s licking and having his first good feed of her milk. Another young mother, the only one to give birth to a singleton. I partially carried her inside when we noticed she was going into labour outside while standing on a rock pile. She was not fully able to walk by that time. They don’t always stick close to their mothers but like to sleep in little clusters in quiet corners. The grandchildren love the kids and come up frequently to see them. Our hoop house is becoming a popular place. We have had our local grandchildren up for a number of visits and the Toronto kids are coming for the weekend to meet the new kids. Neighbours and friends are coming around to see the new arrivals. Even though they are so young, the kids are very entertaining to watch as they learn to run and prance on their wobbly little legs. Here is my first attempt at a video of them. Hopefully more to come. Congratulations you two on becoming grandparents again:9!!!!!! I think you are now qualified to work at the labour and delivery unit of your local hospital! Your video is so cute: this looks like too much fun. How amazing to see all these new little lives come into the world! I’m looking forward to a full report from Abby when they get back! so adorable….one more job description to add to your resume, Bob…labour coach. Loved the photos and video. You could hang a sign out, Birthing House, with all of the visitors dropping by. What a full life you are enjoying..thanks for sharing! 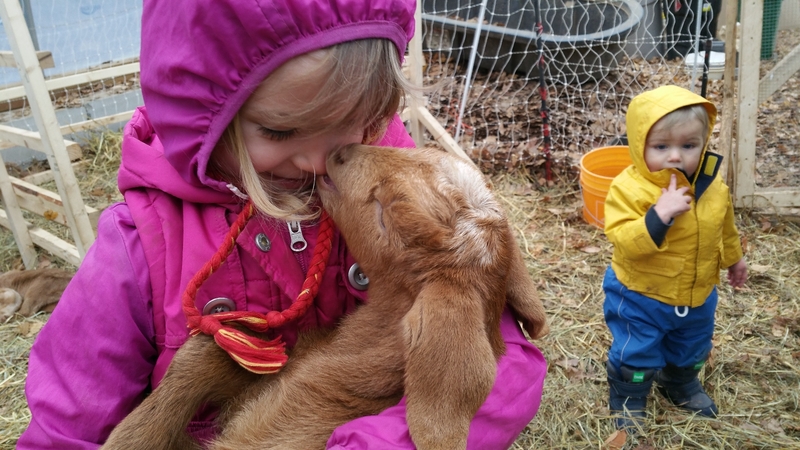 That was my most favorite times on our farm…BABIES!!!! !